Ritual is par for the course with Diamond. Every morning, she sleeps in while I get up and ready for the day. She waits in bed while I shower, get dressed and finish my own morning rituals, until I sit on the edge of the bed to put my shoes on…that’s when she leaps out of her slumber, has herself a good morning shake and begins to paw at me with excitement, tail wagging every which way. It’s time for our morning walk. The rest of her day is spent layered in equal parts with sun baths, kitchen floor naps, momentary grazing, and the back scratch rolly thing dogs do in the grass. Rinse and repeat. At 6pm (almost on the dot and without fail), she begins to pace back and forth in the general direction of whoever is in the room…it’s time for catch. I (or my husband) take a break from whatever we’re doing and walk across the street to the middle school to throw her favorite ball (it’s lasted several months, which is not normally the case). 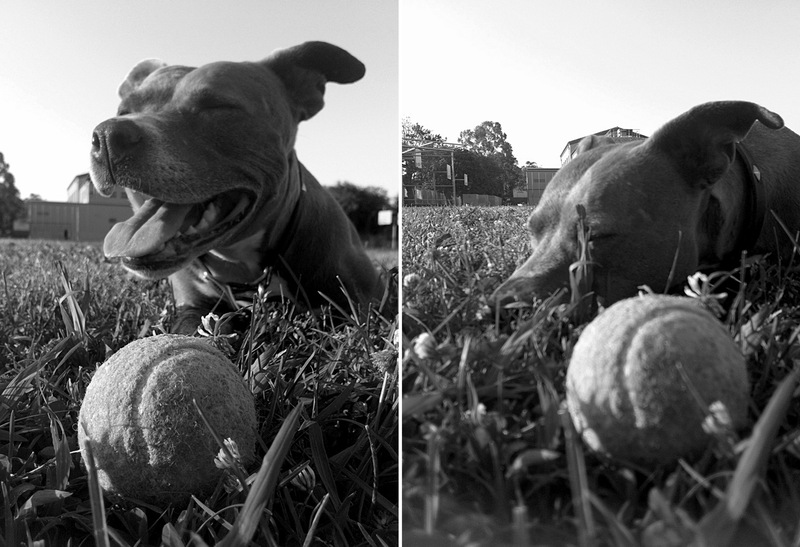 In between catches, she takes short siestas in the grass, catches her breath, and springs back to all-fours, ready for the next throw. After 20 minutes or so, I see that she’s slowing down. She carries her ball home in her mouth, heads straight for her water and then to bed. It’s time to rest up. Tomorrow we do it all over again. Yes, my Little miss Molly thrives when we can stick to the daily schedule. She knows I work (leave house) Mon – Fri, deals with it. Come the weekend ……. I am all hers.